The 1991 Place Name Master File (PNMF) is a digital product which provides population and dwelling counts for census subdivisions (CSDs) and unincorporated places (UPs) linked to enumeration areas (EAs). In addition, the current version of the PNMF also provides over 21,000 other place names (PNs) linked to standard geographic areas through the Standard Geographical Classification (SGC). Each point represents a record in the PNMF. The original dataset is available from Statistics Canada as a text files (.txt). 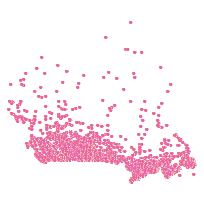 For view in Scholars Portal, the dataset was converted from this original format into a Shapefile using the point coordinates available for each record. Each point is the population centre of an Enumeration Area. The files were converted from text files (.txt) into an ESRI Shapefile (.shp) for view and download on Scholars GeoPortal.